This kit provides a little more challenge constructing the body than some of our other kits, but it’s also a gem in the rough. It literally sparkles thanks to its shiny, anodized aluminum foundation. Everything you need to build the frame is here including the DC motors, 4 wheels, metal chassis, mounting hardware, and a six-battery battery holder. Its body is rather low to the ground, making it suitable for use indoors. Rubberized wheels will provide a nice amount of grip on smooth, flat surfaces. 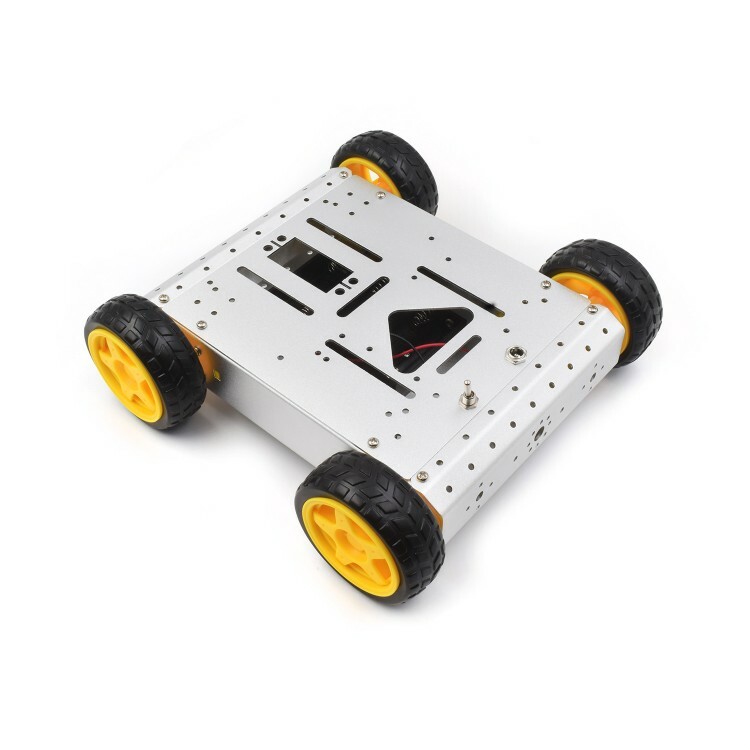 Easy to use with your choice of microcontroller, install your favorite sensors and modules bring this robot car to life. Combination choices are endless, but we recommend pairing: a 2DOF pan-tilt mount with an infrared, light, or ultrasonic sensor to avoid obstacles; Arduino Uno; servo controller; motor driver; perhaps a TOF sensor; and a wireless RF module. Note: This is just the body of the robot. Microcontroller, sensors, and batteries, not included. We like to call this one the armadillo. Cute and durable, this 4WD is compact and low to the ground. It provides plenty of mounting holes to attach accessories like arms or sensors.